Oil on canvas, signed lower middle, original unlined canvas and stretcher--excellent condition, approx. 17.5" x 24" Biography from AskART: Born in Portsmouth, England, George Bonfield arrived in Philadelphia in 1816 and there learned stone carving from a stone master working on the New Jersey estate of Joseph Bonaparte, brother of Napolean. He was also exposed to European art, and successfully copied Old Masters. In 1820, Bonfield enrolled in the Pennsylvania Academy of Fine Arts and studied with Thomas Vest. He became prominent in Philadelphia cultural life. 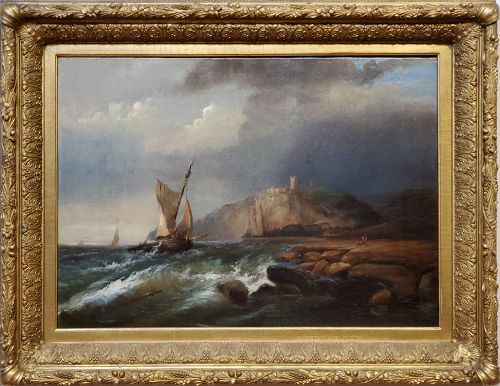 He did some landscapes, but primarily he was a marine artist of scenes along the Delaware River and Atlantic Coast. His work was popular in the 1840s and 1850s, and many of his collectors were wealthy people invested in shipping activities.